People build custom trucks for all sorts of reasons. Some want to walk into the garage, flip on the lights and see a bed-equipped work of low-slung custom art. Others want to look cool rolling their local streets as thumbs get tossed in the air by passing motorists. 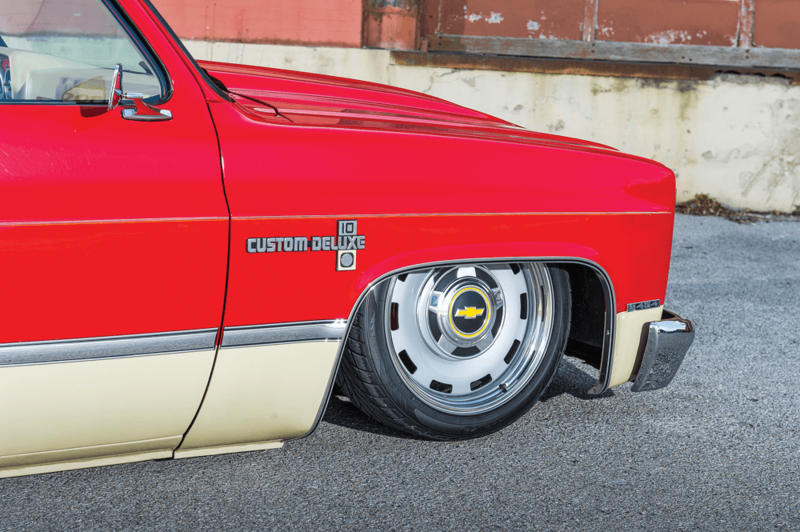 For Ryan Albers of Tulsa, Oklahoma, both reasons would absolutely ring true to his lifelong quest to build a custom truck. The seeds were planted long before he could legally drive. As a kid assembling model cars and reading custom car and truck magazines, the inspiration and influence began when he was still holding onto handle bars rather than a steering wheel. At 17, Ryan purchased a ’75 C-10 long-bed as his first truck and started turning wrenches to keep it running. The need for a reliable driver combined with the inability to take the ’75 off of the road to build it the way he wanted to forced Ryan to send the truck down the road. Long after the sale those old square lines stuck with him, and oh how he longed for another square-body to build the way he’d always envisioned. 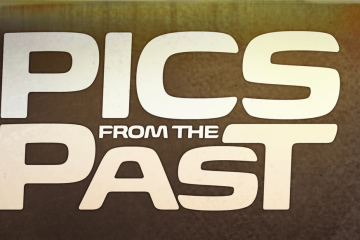 Years later a thorough search uncovered an ’82 short-bed for sale on a small car lot in Arkansas, and Ryan was on his way with cash in hand and trailer in tow. 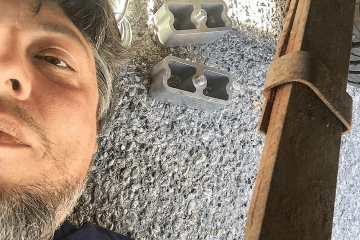 It wasn’t long after the truck hit his garage before the engine and transmission were out, and the sheet metal was separated from the chassis. A 468-CI BIG-BLOCK NESTLED BETWEEN A PAIR OF SLOSH TUBZ FILLS THE ENGINE BAY. One doesn’t completely disassemble a perfectly good running and driving truck to install a set of dropped spindles. 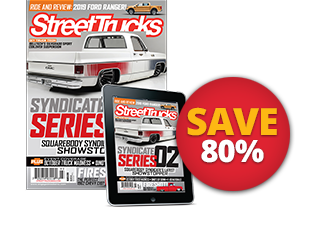 His plan was to lay the truck out over a set of 20-inch Detroit Steel wheels and Toyo Proxes tires, so Ryan got to cutting and grinding. A narrowed Ford 9-inch rearend with Moser axles replaced the ailing 10-bolt, and he cut off all of the factory 9-inch brackets, ground them smooth and fabricated new mounts to cooperate with the suspension. The frame was boxed and a custom front cross member was fabricated. The rear cross member was cut out and moved rearward to provide a slot for the fuel cell. An Ektensive Metalworks 2-link kit makes up the Chevy’s rear suspension bones. Lincoln Versailles rear disc brakes cap off the 9-inch, while Slam Specialties SS-7 airbags hammer the Chevy’s rump. Up front, the leading edge was slammed with 3-inch Belltech drop spindles and Slam Specialties SS-7 airbags. Ryan sectioned the front cross member 2 inches and moved it forward to recenter the wheels in the wheel wells and to help with steering clearance and geometry. To modernize and update the steering, Ryan removed all of the factory components rear cross member was cut out and moved rearward to provide a slot for the fuel cell. An Ektensive Metalworks 2-link kit makes up the Chevy’s rear suspension bones. Lincoln Versailles rear disc brakes cap off the 9-inch, while Slam Specialties SS-7 airbags hammer the Chevy’s rump. Up front, the leading edge was slammed with 3-inch Belltech drop spindles and Slam Specialties SS-7 airbags. Ryan sectioned the front cross member 2 inches and moved it forward to recenter the wheels in the wheel wells and to help with steering clearance and geometry. 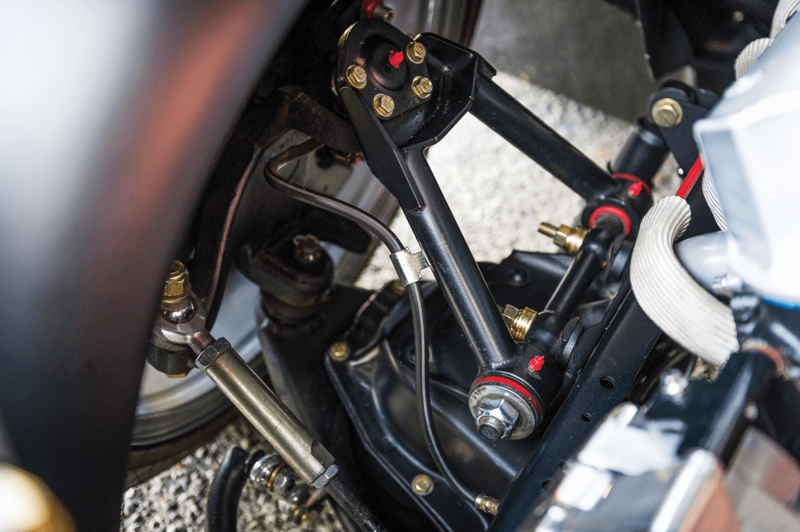 To modernize and update the steering, Ryan removed all of the factory components and fabricated brackets for a Mustang II rack-and-pinion setup with Porterbuilt steering end links. Porterbuilt upper and lower control arms tie everything together, and 20×9-inch and 20×11-inch Detroit Steel wheels with slots custom machined by Scott Nelson at GSI Machine and Fab round out the suspension side of the build. A COMBINATION OF KICKER AUDIO GEAR FILLS THE CAB FOR OFF-THE-CUFF OKLAHOMA CRUISING. 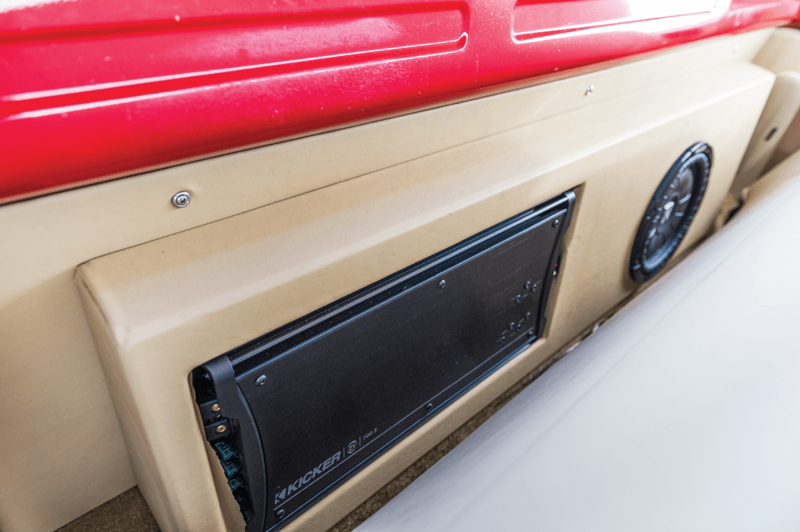 RYAN CUSTOM BUILT THE SUBWOOFER AND AMPLIFIER ENCLOSURE BEHIND THE ’90S GM TRUCK BENCH SEAT. SUBTLE HOTROD PINSTRIPING BY TERRY AT WIZARD ARTWORKZ CAN BE FOUND THROUGHOUT THE TRUCK IN ALL THE RIGHT PLACES. A big-block 454 was summoned for duty under the cowl-induction hood, and the fat block was punched to 468 cubes of camshaft-thumping magic. Ryan assembled the rat after Action Machine in Sand Springs, Oklahoma, cleaned up the insides. A COMP Cams Mutha Thumpr bump stick produces the requisite rumble, while forged rods and Keith Black pistons travel in the massaged cylinder walls. Polished and port-matched rectangular port cylinder heads equipped with Manley stainless-steel valves and hydraulic lifters, COMP Cams pushrods and springs do the breathing. ARP hardware and COMP Cams roller rockers complete the valvetrain. PORTERBUILT UPPER AND LOWER CONTROL ARMS, BELLTECH 3-INCH DROPPED SPINDLES AND SLAM SPECIALTIES SS-7 AIRBAGS SEND THE FRONT SHEET METAL SOUTH, WHILE POTERBUILT STEERING END LINKS WORK WITH THE MUSTANG II RACK-AND-PINION SETUP THAT RYAN INSTALLED HIMSELF. 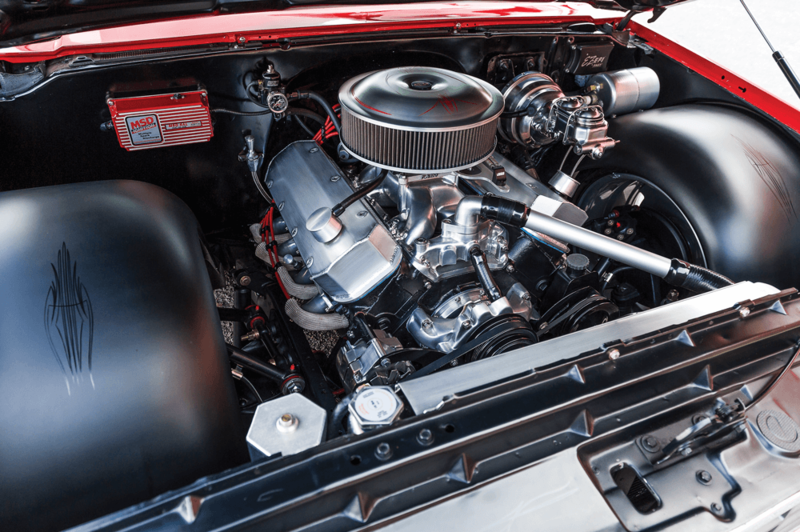 A Jegs high-flow aluminum water pump and four-core radiator provide cooling refreshment to the blistering big-block. A Professional Products Crosswind intake manifold topped with a FAST EZ-EFI setup sends the air and fuel mix down the big-block’s pie hole. Sanderson headers hook up to a 3-inch custom exhaust system with X-pipe and Cherry Bomb mufflers built by Ryan that dump in front of the rear axle, sending octane cocktails packing. Dual electric fans smother the big-block in fresh, cool air to keep temps in check for extended cruising sessions. Backing the pavement-stomping rat is a Turbo 350 transmission prepped by Ryan and stuffed with a TCI Streetfighter 3000 converter and B&M Stage 2 shift kit all commanded by a Hurst ratchet shifter. Next it was time for bodywork and paint to get Red Rat looking as good as it sat and sounded. 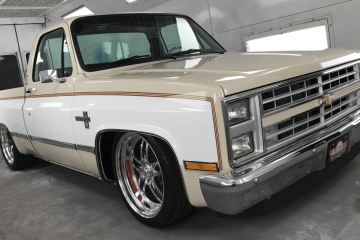 The truck was delivered to Rick Steinberg at Rick’s Body Shop to smooth out all of the bumps and bruises, delete all of the factory annoyances and get treated to a new coat of two-tone paint. A Goodmark cowl-induction hood supported by a WAM Rods hood strut kit conceals the ground-shaking BBC for cruising and exposes it for shows. A factory rear sport bumper was tucked in close to the bed to tighten up the lines. Subtle metal mods include shaved drip rails, front side markers, stake pocket holes, cab seams, windshield wiper cowl and a flipped tailgate handle with Blazer tailgate band insert. Up front, the leading edge was updated with a 1988-91 Suburban front clip with LMC Truck grille and head lamp surround. All new badges, fender trim and side molding were installed to maintain the truck’s OEM heritage. After Red Rat was arrow straight and all of the gaps were tight and precise, Rick laid down the PPG Victory Red and Light Saddle Tan combination that takes you right back to the dealership floor in the early ’80s. Terry at Wizard Autoworkz performed the clean and classy pinstriping work around the truck and under the hood for simple, elegant accents. 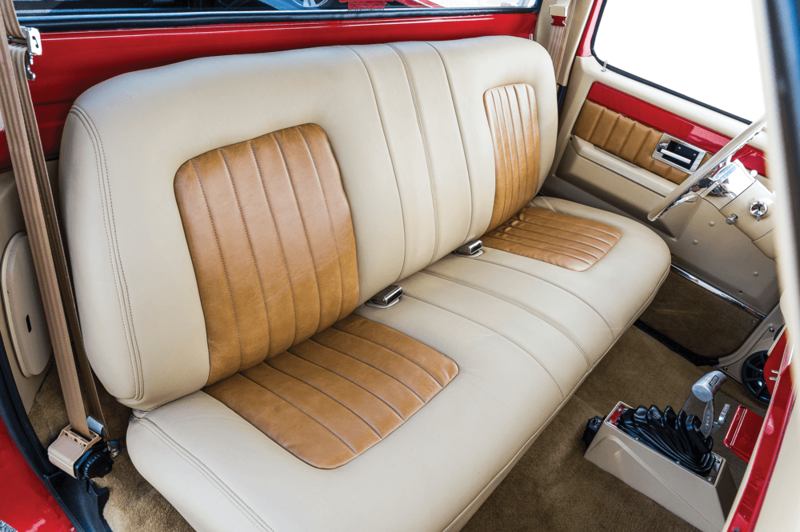 RED RAT’S INTERIOR IS DRESSED IN TWO-TONE VINYL STITCHED BY LEW’S AUTO TRIM OVER A ’90S GM TRUCK BENCH SEAT. 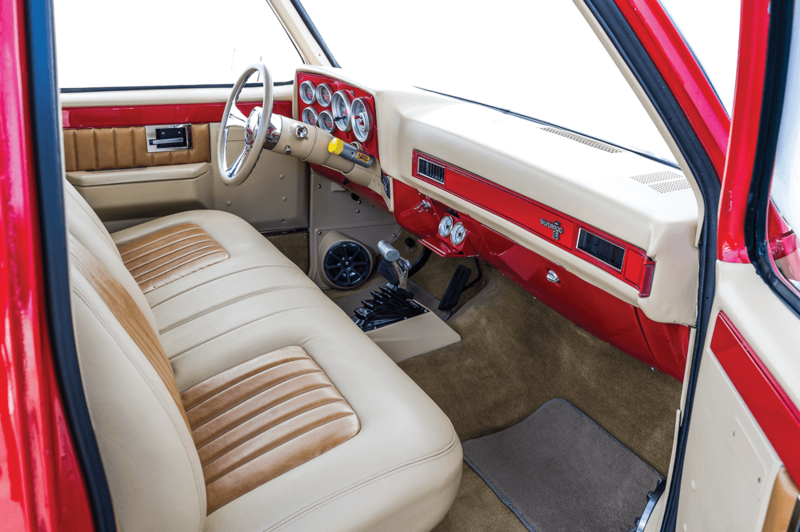 A BILLET STEERING WHEEL, VICTORY RED IN ALL OF THE RIGHT PLACES AND FRESH CARPET ROUND OUT THE INTERIOR STYLE. TWENTY-INCH DETROIT STEEL WHEELS WITH CUSTOM SLOTS MACHINED BY SCOTT NELSON (GSI MACHINE AND FAB) WITH CUSTOM HUB CAPS GIVE THE TRUCK A ONE-OFF LOOK. 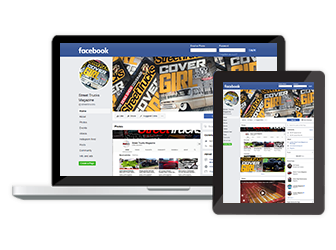 TOYO TIRES PROVIDE THE ROAD CUSHION. 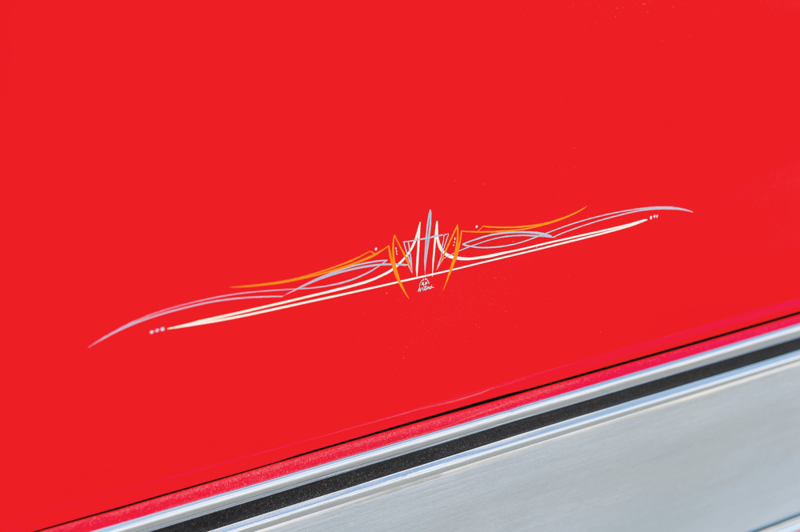 Between the doors, the cruising office was mainly updated with seat stitch work on the ’90s Chevy truck bench seat performed by Lew’s Auto Trim using a combination of two-tone vinyl. 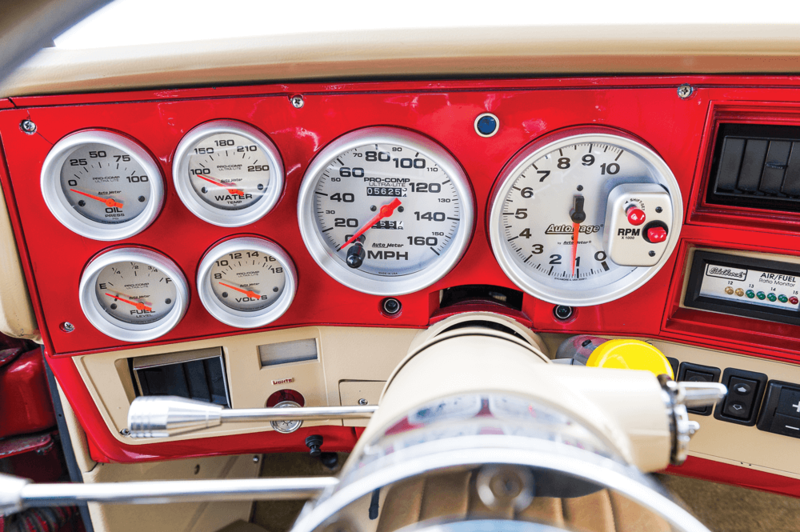 A replacement dash cover was sourced from Chris Lucas at 73-87 Trucks, while a billet steering wheel handles navigation duty. Replacement seat belts from LMC Truck keep everyone buckled in when Ryan pushes the fun pedal and lets the big-block shout. Ryan fit an ACC carpet kit to the floor, and a headliner from 73-87 Trucks was installed to clean up the roofline. 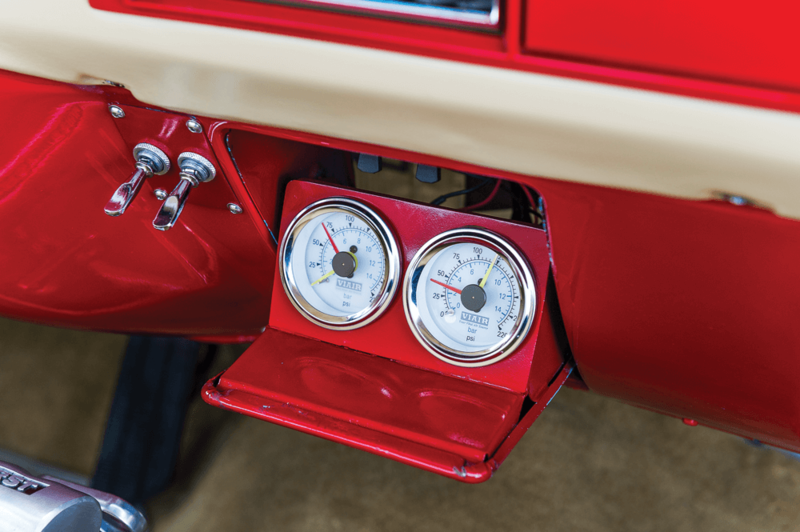 Auto Meter Pro Comp gauges report engine vitals, and a Painless wiring harness connects all of the electrical dots. LMC Truck interior handles replace the worn originals. For cruising tunes, Ryan assembled an arsenal of Kicker Audio gear and built and covered a custom box behind the seat to house the upgrades. Kick panel speaker pods from Chris give a factory look to the Kicker midrange speakers. 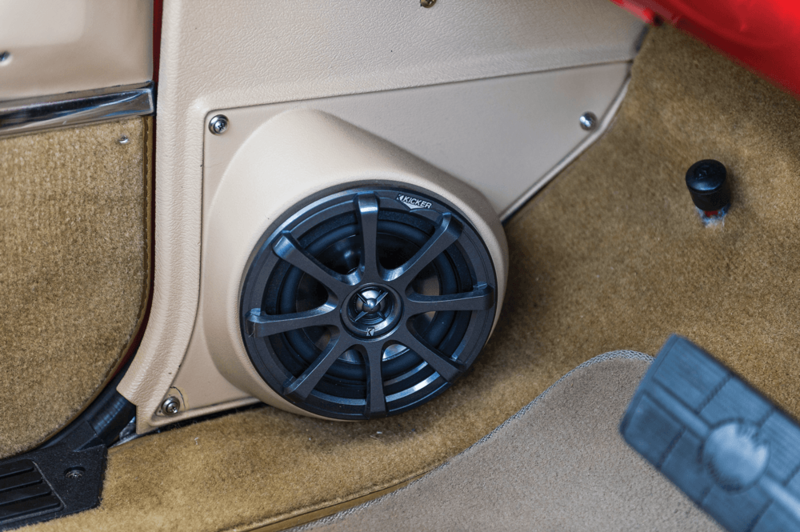 Fat Mat sound deadener was used throughout the cab to keep wanted noises in and unwanted noises out, while two Optima batteries were sourced to get this low-slung performance and speaker-pounding party started. 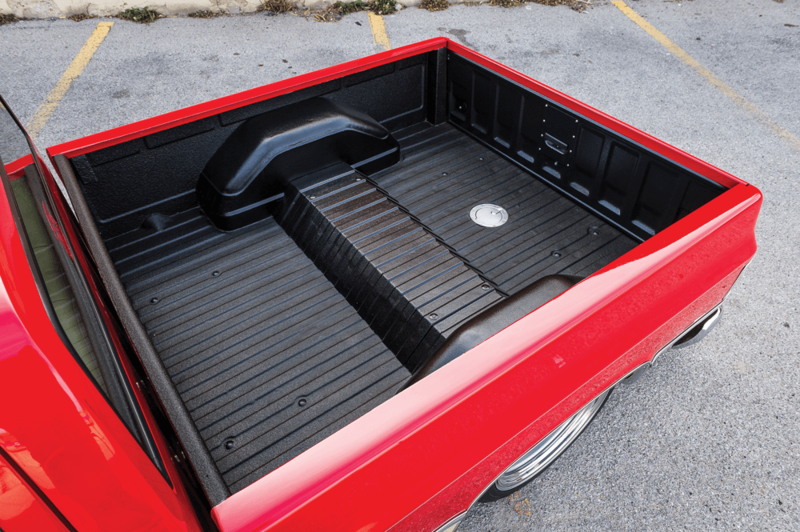 THE FACTORY BED FLOOR AND WHEEL TUBS WERE RAISED, AND A CUSTOM NOTCH COVER WAS FABRICATED AND COVERED IN BLACK SPRAY-IN BED LINER TO HANDLE CAR SHOW HAULING ABUSE WHILE STILL LOOKING GREAT. 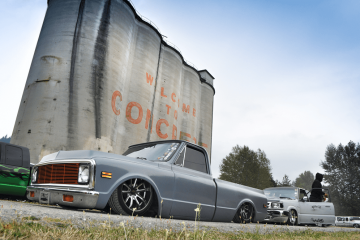 Ryan Albers has fulfilled his dream of building and owning a custom square-body C-10, and he never misses a chance to take his wife, Amanda, and his little girls for a ride. It just doesn’t get any better than that.